The number of wild boars in this district increases, and the damage of the field has become serious in recent years. Its maintenance becomes a hell of a time, too, when there are too a lot of wild boars though damage can be prevented in the electrified fence. Then, the cage (trap) where this wild boar was captured decided to be set up. It made it in the nearby ironworks. 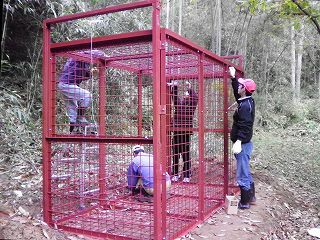 The cage of the plastron for the wild boar capture (trap) was assembled. This is the one having bought it by using the subsidy in this district. It was about 180,000 yen each. The area is about 1.4m X 3m and has about 2m height. On and the under are enclosed in the iron-barred window. The door at the entrance is on both sides of the longer side of the cage. The installation location was set up in the hunter, and it judged, and it set it up on the road as shown in the wild boar. Therefore, it is a field in a mountain left from the house. Human strength became a main in carrying materials. It took about two and a half hours per one for assembly and the installation in hanging of six people. It stopped it with the bolt and the nut while seeing the drawing as shown in this photograph. This photograph is a cage set up in the place besides the place in the photograph above. Here is a field in a mountain considerably left from the house. The soil is put like this under the hedge (cage), and the wild boar is prevented from watching it. 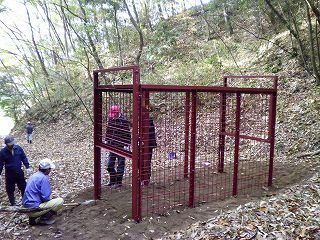 The town and the hunter's permission is necessary to set up the cage. We ask the hunter and kill with the gun when the wild boar can catch. After it completes, this photograph starts packing the stone under one of props because in all horizontal is bad. It doesn't capture it here in this hedge (cage) at hunting period though it is usually from November to about February to capture the wild boar. Because hunter captures it at hunting period with gun and hound, for hound to mistake, to enter cage, and to make it not cause an accident. It injures in the accident, it dies because the hound is a dog that did special training, and the amends are very difficult. The hound seemed to narrow on the door of the cage for the capture of the wild boar in other prefectures and there to be an accident (the injury, and the death). It is made not to fall with both of both of this door opened by the demand from the hunter. Food for the wild boar is put in this cage between until March. The resident in this district allots this. The capture in March is the enjoyment.